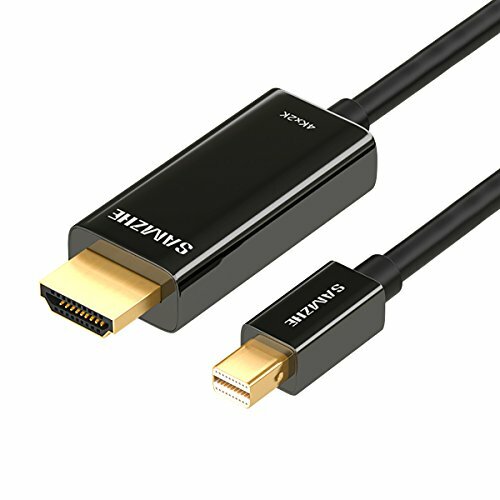 The SAMZHE Mini DP to HDMI adapter cable allows you to connect your mDP equipped video sources to HDMI equipped monitors, projectors or TVs. Compliant with DisplayPort 1.2 and HDMI 1.4 standards, this active adapter supports up to 4K UHD resolution at 30Hz thus you can get the most out of your high-end A/V equipment. Plus, with a compact, lightweight dongle cable design, this gadget is easy to carry and ready for use whenever you need it. 4K Ultra HD Experience-Adapter Cable can support 3D video up to 1080P and up to 3840 x 2160 resolution a 30Hz, 8-bit color. 4K Ultra HD revolutionizes the way you view your screen with four times as many pixels as commonly used Full HD screens, opening your eyes to new world of sharp detail. This adapter also supports HDCP 1.4 content protection for error-free viewing of protected contents. If you have a 4K UHD TV, monitor or projector, you're ready for the revolution. Easy connections -This is the easiest solution for connecting your TV, monitor or projector to a Mini DisplayPort compatible device such as MacBook, iMac, and MacBook Pro. You dont need extra cables or extra adapter,only one cable can solve all these problem.Self-powered with no external power required, the VLink HDMI 1.4 Active Adapter is ideal for your office, home entertainment display, conference rooms, trade shows, and more. 2 years quality warranty.Come with one adapter cable. If you have any questions about this product by SAMZHE, contact us by completing and submitting the form below. If you are looking for a specif part number, please include it with your message.